With each show in the U.S., the growing pains heal a little easier for Eddie Hearn. 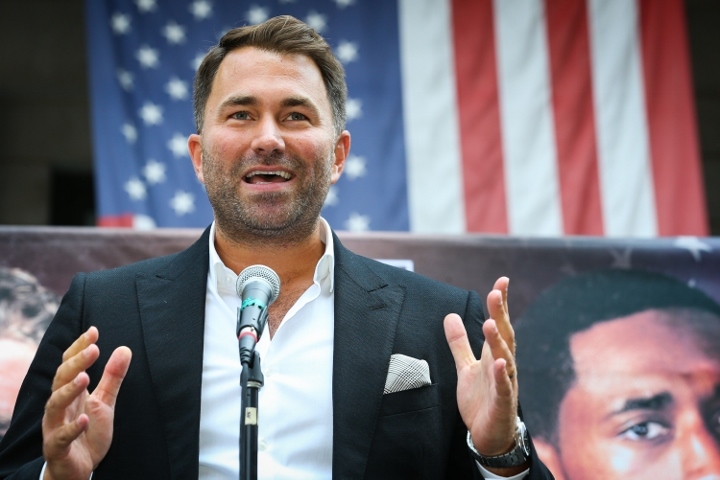 For years the leading promoter in the United Kingdom, Hearn’s Matchroom Boxing USA model took some time to get off the ground but looks to have hit its stride with its recent run along with what lies ahead. A big step forward came in the success of a recent DAZN-streamed show live from Philadelphia, which featured a healthy mix of local and Irish flavor to help kick off St. Patrick’s Day weekend. “It feels we’re starting to get some great momentum, and not just with May 4th and Canelo (Alvarez)-Daniel Jacobs and the June 1st (Anthony) Joshua-(Jarrell Miller) Madison Square Garden show” Hearn told BoxingScene.com. “The March 9 show with Dmitry Bivol and Joe Smith—on paper—was a step in the right direction but didn’t quite click the way we hoped. The March 15 event at the Liacouras Center drew rave reviews from those watching the livestream along with the rabid crowd in attendance. Greatly assisting in the effort was the grassroots work put in by Hall of Fame promoter J Russell Peltz and marketing strategist-turned-rising promoter Michelle “Raging Babe” Rosado, with the combined efforts of all involved putting 5,246 in attendance, none of whom left disappointed. “When you have people turn up to these events, you want them to walk away saying, ‘Wow, that was fantastic,’” notes Hearn, who admits that developing a fan base for his U.S.-based boxers has been a challenge he’s determined to conquer. The formula has been easler to apply on the other side of the Atlantic, where the British fans have proven a faithful and loyal audience through the years—even at the cost of Hearn himself drawing a chorus of boos from any given UK crowd. He came to the U.S. already armed with the biggest gate attraction in the world today, as Joshua has sold well over 300,000 tickets over the course of his last four title defenses after selling out smaller venues (read: 12,000-18,000 seat arenas) in a manner of minutes after going on sale to the general public. Hearn’s UK arsenal, however, didn’t seem to mean very much to U.S. audiences—or athletes—right out the gate. “I admit, I was a bit naïve to think I could just stroll in and sign everyone from day one,” Hearn reflects, although his U.S. roster continues to grow as the DAZN platform continues to invest more heavily into the sport. “So for me and for our team, the challenge was understanding the market place and the mindset of the average customer. Two such boxers both made their respective pro debuts on back-to-back weekends. Otha Jones, a 19-year old prodigious talent and 21-time amateur champion from Toledo, Ohio survived an extremely aggressively matched pro debut on the March 9 DAZN show (Bivol-Smith), scoring a six-round decision. One week later came the first pro fight in the career of 19-year old Raymond Ford, a 2018 National Golden Gloves champion from Camden, New Jersey who won a four-round decision on last weekend’s show in Philly. The card also continued the latest step in the development of Kazakhstan’s 2016 Rio Olympic Gold medalist Daniyar Yeleussinov. While the young roster of talent figures to bode well for the long-term future of Matchroom Boxing USA, the impressive current schedule figures to do quite well for the DAZN brand. Beginning with a stacked April 26 show in Inglewood, Calif.—topped by the rematch between Srisaket Sor Rungvisai and Juan Estrada, along with a 122-pound title unification clash between Daniel Roman and TJ Doheny—comes an avalanche of top-shelf talent all the way through late June. “The two shows we just had, now leading into April, I really feel like we finally have some great momentum going. The April 26 card has gotten a tremendous response already. The big one on May 4 with Canelo and Jacobs—the first of three big middleweight shows in the next couple of months, with Demetrius Andrade and GGG (Gennady Golovkin) fighting (jn separate bouts, and likely on separate shows) in June. Hopefully we get to see more up & coming US prospects fighting in the UK & vice versa. The experiance & exposure of fighting abroad is invaluable for young up & comers.